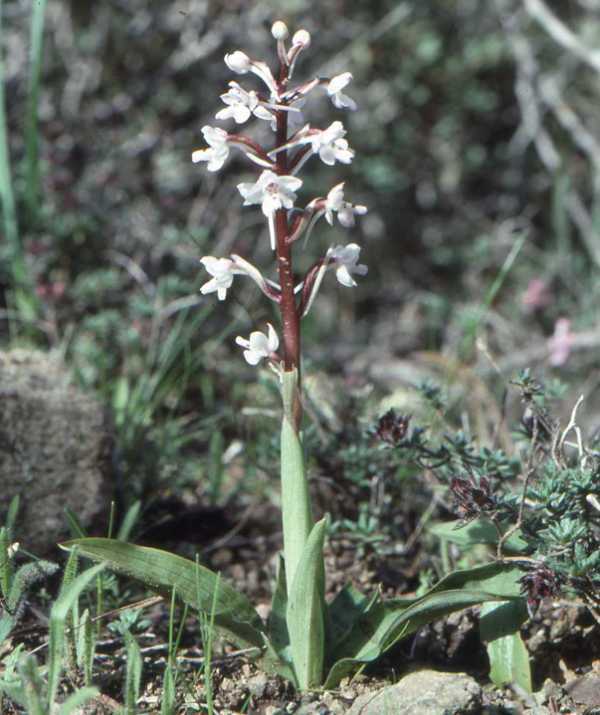 Orchis quadripunctata grows to 40cm in height and has 2-6 basal leaves which can be spotted or unmarked. There are futher small leaves clasping the stem higher up. The stem is washed dark red towards the tip. The inflorescence carries between 8-35 flowers which can be either pink-purple or white. The upper petals form a small hood over the lip of the flower. 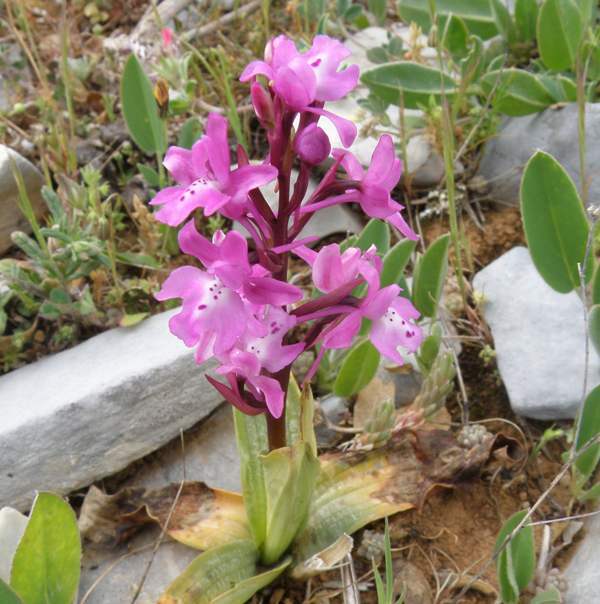 The lip is deeply three-lobed and is marked with dark red spots in the centre, which despite the name of the orchid, can number fewer or more than four. At the rear of the flower is a spur measuring up to 14mm in length which points downwards; it is narrow and somewhat sinuous. In a good location this orchid carpets the ground. 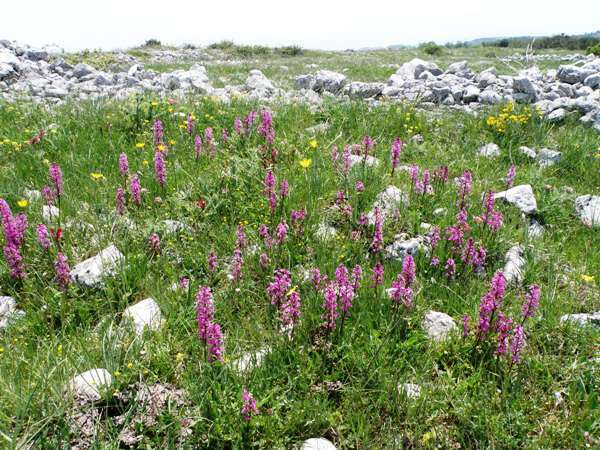 The Four-spotted Orchid can be found in Crete, Italy and the central and eastern Mediterranean region. 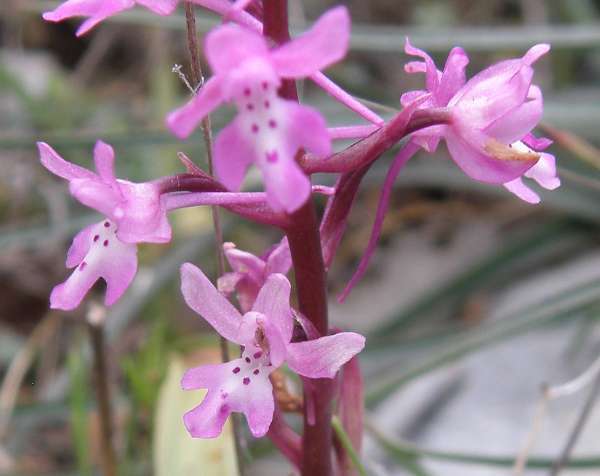 THis orchiod grows in both full sun and lightly shaded habitats, most often on chalk grassland, garrigue or open woodland. The specimens shown on this page were photographed in the Gargano Peninsula area of Italy, and we have also seen and photographed them in Crete.